Discover Madrid on this 4-hour Segway private tour. The most complete tour in segway. Do you have only a few hours to explore Madrid?, Don’t let go this visit in segway all around Madrid! Enjoy Madrid in the most complete Segway tour which includes a small stop to have a drink with a Tapa. Parque del Retiro, Madrid Río, Casa de Campo, the historical center and Debod’s temple. An obligatory and funny visit if what you’re looking for is get to know Madrid. Combine fun with sightseeing and enjoy the advantages of visiting it by segway. Tour for all of those who want to save time, have fun and sightsee in an original and different way. Tiredness? Noooo. Segway allows you to explore 30 km in 4 hours without getting tired and it includes an appetizer. In all of our Tour we include a small training inside our local to learn how to ride a segway. In every tour we provide you an officially approved helmet. Start your tour meeting your guide and take a short training session to learn to operate the segway with confidence. Once you feel comfortable, you will be ready to start this amazing tour. 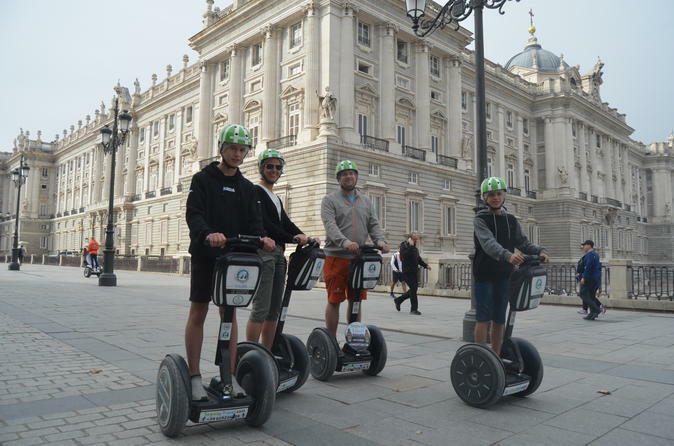 On this segway tour, during 4-hours, you will visit the most important places in Madrid. During 20 min, you will stop in a restaurant to take a tapa and a drink. And after that, you will continue riding a segway through all the most important areas in Madrid and you will see the most popular monuments.